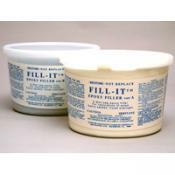 Fill-It by Smith & Co.
Pre-thickened, high strength, non-sagging, flexible, and easily sanded epoxy filler consisting of an epoxy resin and a curing agent derived from natural wood resin and so is very compatible with wood. It has sufficient compressive strength that it may be used to fill defects in ferrocement hulls, and sufficient flexibility that it is suitable for wood or fiberglass boat hull repair as well as wooden beams, window sills, or other parts of buildings. Cures overnight. Contains the Dual Synergistic Catalyst for cold weather cure. 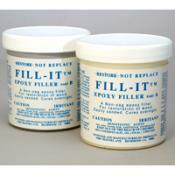 Coloring pigments for use with fill-it and other epoxy products. Contains four pigments to create earth and wood tones.